Christie's, the world famous auction house, is set to hold a charity sale this February in order to raise money for The Photographers' Gallery. The Photographers' Gallery, as stated on their website, is the largest public gallery in London dedicated to photography, covering everything from the latest hot-shot talent to well established names on the photography scene. An impressive historical archive also ensures that the gallery deserves the support to expand and grow. 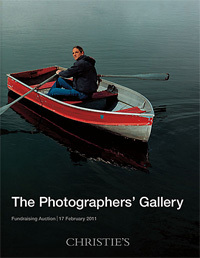 The charity auction to be held at Christie's will raise funds for the construction of a new building in the West End of London, allowing The Photographers' Gallery to respond to the consistent growth of popularity in the field of photography. The new premises, which will be a conversion of a former Edwardian industrial warehouse into a sparkling centre devoted to all things photography, is set to open in Autumn 2011. The new space will feature public galleries, a floor dedicated to education, a print sales room, a bookshop and a ground floor café. There will also be an interactive element where visitors can upload their own images in the café to be displayed on the Wall for All. The auction itself will be held at Christie's South Kensington sale room on the 17th February and the catalogue is available to view on the Christie's website.